As I mentioned yesterday, this weekend Pat and I celebrated our anniversary. For us, that usually just means a nice dinner out. This year's dinner out was a comedy of errors that won't soon be forgotten. In addition to dinner, I always like to give Pat a little something that I've made for him. 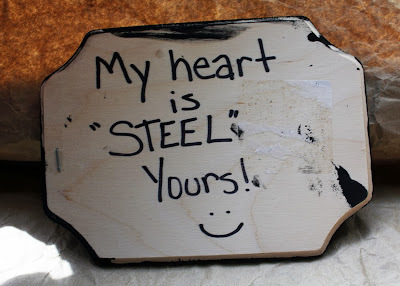 I started by finding out that the traditional 11th anniversary gift/material is Steel. This article from The Nest suggested items like tools, a flask, handcuffs, etc. While those were all interesting ideas, I decided to take my own route. 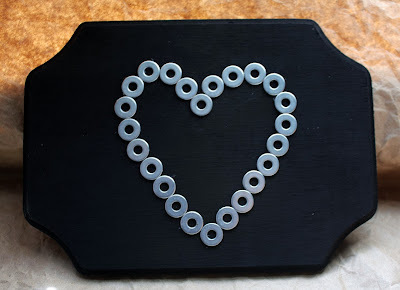 This is simply made of a wood plaque painted black with metal washers glued on. I used some E-6000 glue. Turns out it's kinda hard to find plain steel washers since steel has to be coated with something to prevent it from rusting. These are coated with zinc, but I figured the general idea was there. Since I'm a punny girl, I quickly wrote this sentiment on the back of the plaque. Yeah, I'm pretty corny but Pat thought it was funny and that's all that matters. 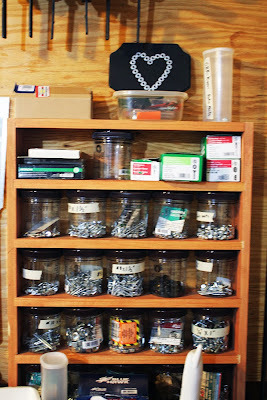 Since Pat's been all into his garage workshop lately, I told him this was to help decorate that space. Here's where I found it today. As you can plainly see, I do make more than jewelry sometimes. How sweet he must be. Love that! Happy 11th Hope, the heart is a very nice gift, pun and all. I love this post! Congratulations to both of you. Adorable!!! Huge congrats on 11 years! That's a great accomplishment and I love the way he showcased your plaque!